Sam Lipsyte’s America. ALSO, how Woody Allen, Bob Dylan & LCD Soundsystem approach American decadence with a similar sense of humor. 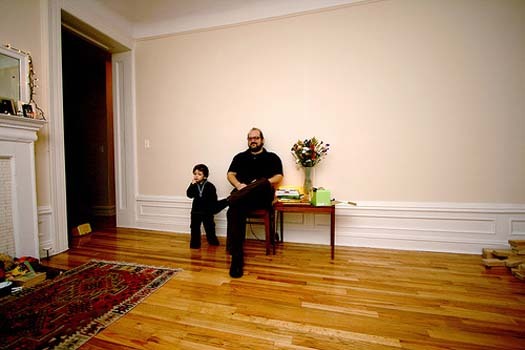 Image of Sam Lipsyte with son via Flickr. I’ve been a huge fan of New York novelist Sam Lipsyte since reading his pretty much unimpeachable 2004 novel Homeland. His new novel, The Ask, is that rare bit of fiction whose publication I anticipated eagerly. Unfortunately I don’t think Lipsyte’s new book coheres in the same way as Homeland did. The Ask lacks both a convincing plot and the devastatingly clever literary conceit that elevated that book. (Homeland took the form of inappropriate, intimate letters to a high school alumni newsletter, 20 years after graduation.) And, finally, this new book’s conclusions are depressing in a way that seemed more exhausted than insightful. It’s as if Lipsyte was so tired of living with these characters he preferred they collapse at the end of the book rather than come upon some germ of real truth or real meaning.